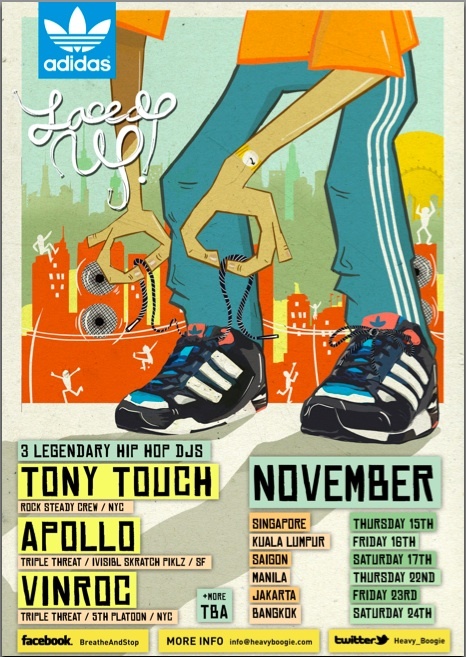 After the wildly successful Adidas Breathe and Stop Tour last August, Adidas will be throwing another epic party with three legendary hip hop DJs in tow this time around: DJ Apollo, DJ Vinroc, and DJ Tony Touch. They will be touring across six iconic South East Asian cities, including Manila and will be rocking the house with a diverse selection of hip hop, funk, soul, house, and reggae. Their Manila stint is set to happen this Thursday, November 22, at Time Club, Makati Avenue, Makati City. Get ready to be amazed by the World Champion level technical skills and unparalleled musicality of this DJ trio at the event! Aside from that, the Breathe and Stop Champion dance crew will also be featured in an exclusive showcase performance. This is sure to be one non-stop party rocking extravaganza, so don't miss it! For more details and updates, like Breathe and Stop on Facebook!